AIMING for a big name on the country music scene are Tamworth duo Andy Dwyer and Alan Whittle. And they’ve just won themselves a regular nightspot in the town. The two singer-guitarists are playing on Monday nights at the Prince of Wales, Gungate. Andy Dwyer and Alan WhittleCalling themselves “Idlevice”, 25-year-old Andy and 28-year-old Alan are aiming for a crisp, swinging country sound. But they also include old skiffle numbers and even a little rock occasionally. Andy of Belgrave, is a full-time entertainer and already has a solo LP out. He won the outstanding soloist award in a Melody Maker folk rock competition. Living at Coton Green, Alan teaches in Birmingham. He plays guitar, bass guitar, and five-string banjo, and he recently got through an audition for a spot on TV. “We’ve both performed regularly at folk clubs in the Tamworth area for a long time, and now we’re hoping to become established in the Midlands as a whole,” said Andy. I came to live in Tamworth in 1974, I was a 24 year old teacher in Birmingham and I couldn't afford a house in the city. But my wife and I, with our combined incomes could just stretch to a house on the Coton Green estate - right next to the railway lines. I was already a pretty adept fingerpicker when it came to guitar playing, and I had worked my way through several gruelling Stefan Grossman's How to Play Blues Guitar schemes, but I had never performed in public, although I had a burning desire to do that very thing. Week after week I used to take my guitar up to the Prince of Wales top room where Andy Dwyer held his folk club. Somehow I just couldn't work up the nerve. I really admired Andy - he was five years younger than me, but he had already made a name for himself - he had won a Guild Guitar and record contract in the Melody Maker folk rock competition. This means he had beaten a whole load of bands and players far older and more experienced than himself. His voice had a dramatic vibrato on high notes, and he synthesised words and music into songs effortlessly. A whole ten years before Billy Bragg was famous for singing political songs, Andy was writing songs about the realities of growing up in Brum. One song told about a Birmingham bus factory that made segregated buses with different sections for black and white passengers, for the South African market. However Andy was very working class - turned up for gigs in his best suit, shook hands with the club organisers - which always seemed a very middle aged thing to do. And rather than hailing an up and coming talent, the middle class Steeleye Span fans who filled 1970's folk clubs - were dismissive of Andy. Two years or so later and by now I had conquered my fears. I had a jug band called Juggerlugs, which for a short time did a residency at Tamworth golf club, and |I had done floorspots anywhere they would allow me to stand up and sing. I could still play better guitar than anyone I knew on the local folk scene, but I lacked presence and the skill necessary to project a song. 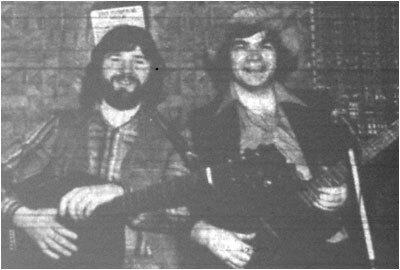 Andy was making slow progress on the folk scene, but an agent called Bernie Lewis had spotted him and offered him some gigs in working men’s clubs. With just an acoustic guitar, Andy was dying the death in these places, but I swapped my lawn mower for an old Antoria bass guitar and together we became a country and western duo - Idlevice. We still died on our arses most places, but some places did like us and we worked quite regularly. Andy hated the social clubs, but I could see a sort of strength in that type of music that in my mind gave it more integrity than a lot of the so called folk music. When the magic worked and you got the people up dancing, you really felt that you'd hit a nerve - and connected at more visceral level, than a gang of middle class folkies pretending that Martin Carthy's modal experiments were in the least bit to do with ordinary folk. When I wrote my only hit record in 1983, it was using a rhythm that I used to play Save the Last Dance for Me in the social clubs of the Midlands, and that I had discovered really got folks out of their seats and dancing. After a while Andy and I split up. My idea, and one of my worse. He was a great talent, and we were stronger together than apart. However some of his fans didn't like me very much and didn't mind letting me know. My wife was very ill, and I had to give up my teaching job to look after her. I started looking to my musical skills to make a living, whereby I wasn't having to leave her unattended everyday. So I started a solo act. I also took over Andy's Orton on the Hill folk club at the Unicorn for about 18 months. Andy and I were also running a singers club at the Globe. And I started giving guitar lessons. The only real success story from those years was teaching guitar to Donald Ross Skinner. Donald had talent oozing out of every pore, and I don't suppose any teacher could have actually stifled those talents, but from what he has said since - I think maybe I was lucky enough to have been the right teacher in the right place. In 1979 I couldn't afford the mortgage on a Tamworth bungalow (and my wife was so seriously disabled by now that we needed a bungalow) so I moved to Nottingham, where I bought the bungalow I now live in and which has served as a home for my wife and myself. Donald phoned me up not long after I moved and asked if he could continue with the guitar lessons, I told him - it really was too far for him to come just for a guitar lesson, and there were probably better teachers. I think the next time I heard from him was when World Shut Your Mouth was at number one and I got an invite to see him blow the room away at Rock City in Nottingham. Whist I was in Tamworth I did an Open University degree and one of my fellow students was Tony Lee (Concept – Ed. ), who was a groovy looking bank manager who played keyboards. He was a bit too sophisticated for me, I got the impression I bored him. However - a nice guy. The full profile and history of Idlevice has yet to be added to TamworthBands.com Call back soon to read the full band details.